Contrary to popular belief, Mom and I tend to stay away from fast food. I know that a lot of people will think that we are pulling their chain, but believe it - not all fat people are obsessed with eating this junk. Although we do sometimes go with the flow and buy a couple of burgers, we tend to stick with ordering pizza and Chinese if Mom doesn't feel like making dinner from scratch. I'm not even that much of a French fry fan, which again, is shocking to some people. Well, on this horribly rainy and miserable day, Mom and I had a craving to eat a greasy burger, fries, and milkshake combo. At first, I was against it as we haven't had that food in a while and have gotten sick on earlier visits. However, as the day went on, I was all for it. After choosing between McDonald's (better burgers) and Burger King (better fries and shakes), we went with Burger King. Despite the 50/50 chance that we would be nauseous afterwards, I threw on a pair of dirty sweats and left the bra at home (hey, I gotta look the part, right?) and headed for the drive-thru. I pulled into the Plymouth Avenue location in Fall River at 2 p.m.
You can always smell Burger King before you see it, which I'm not sure is a good thing. The aroma of flame-broiled burgers cooking does make you hungry, but as you drive closer to the building, the scent changes from sizzling meat to boiling grease. Still ... I continued on. Since I wasn't dressed appropriately for public view, I was going to order my food in the drive-thru. There was only one car ahead of me, so I didn't have to wait long to place my order. 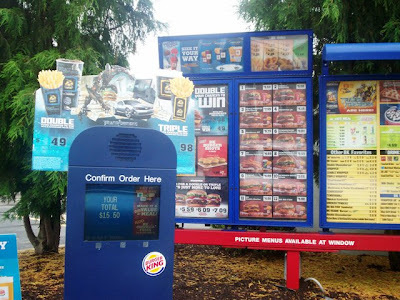 When it was my turn, I pulled up to the large, colorful menu and ordering screen. I ordered two #1 value meals (a Whopper, fries, and soft drink). For Mom, I ordered her Whopper plain with no cheese. God forbid there be a tomato or a pickle on it - she'd freak! I ordered my Whopper with all the stuff on it, but no cheese. For our beverages, I chose two vanilla shakes instead of the soft drink. Since the value meals come in medium and large, I chose the medium size for both. After all, we were on a diet ... once. My total came to $15.50. I pulled ahead to the first window where I noticed a sign that read: "Stop and pay here." I stopped, and waited to pay ... and waited ... and waited. I waited so long, that the car ahead of me at the food pickup window had already driven off, and the guy in the car behind me had frantically started beeping his horn. I pulled up to the food pickup window where the cashier already had my shakes ready. I told her about the "stop and pay" sign at the other window, and she apologized and said that someone would remove it. She took my money and handed me the shakes in that nifty double duty box (which holds two shakes surprisingly well), as well as the bag of burgers and fries. I pulled over to make sure that Mom's burger was made correctly (just meat and bread), and it was. As I was inspecting her burger, I noticed the overwhelming smell of grease. Uh oh ... maybe this meal wasn't such a good idea after all. Oh well, I couldn't turn back now. I quickly drove the food home to Mom. When I got home, Mom and I laid out the food. 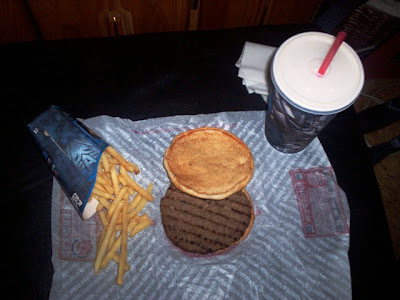 I ended up cutting my overstuffed Whopper in half because it would be easier to deal with. Mom's value meal was as tasty as she thought it would be, and also just as greasy. Mom finds the Whopper so greasy that it's hard to peel the bun away from the patty. They're practically glued together. As she took her first delicious bite, she wondered how long it would be before she got sick. The fries were hot, salty, and crisp. They also seem to travel much better than McDonald's fries, which become limp when you get them home. The shake was fantastic - nothing greasy there (just fatty, ha, ha)! It was cold, flavorful, and had a great vanilla taste. Mom really enjoyed this once-in-a-great-while meal, but she's just afraid at what might happen next. Yikes! My Whopper was also very good, but they tend to overdo it on the mayonnaise, which I'm not really a fan of. I should start asking for it without mayo, but since I don't visit Burger King often, I always forget about this when I order my meal. The vegetables inside the burger were very fresh, the shake was very tasty, and the fries were crisp. I like to dip my salty fries inside of my sweet shake. Mom thinks that this is disgusting, but she likes to dip a plain potato chip into a cup of ice cream. It's the same thing! Salty and sweet - one of the best flavor combinations. Cut to about a half hour later, and I was already not feeling well. Oh man, what did we get ourselves into? 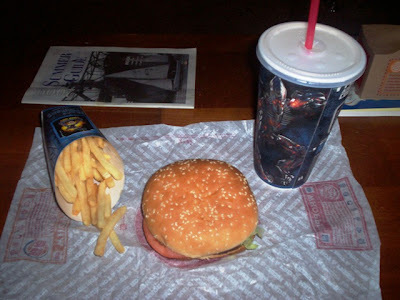 The funny thing is, when I was younger, I could eat this food every day and night. I loved it! Now, in my old(er) age, I say things like, "Oh, that gives me heartburn," or, "Do you have any Rolaids for afterwards?" Maybe Mom and I should just lay off eating fast food altogether, but every once in a while, the cravings are just too strong to overcome. 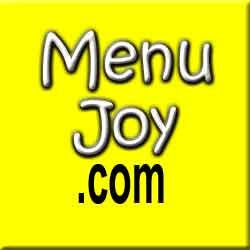 Everyone has their favorite: Burger King, Wendy's, McDonald's, Sonic, In-N-Out Burger, and so many others. We really have nothing against Burger King, and I really do love their seasonal Italian chicken sandwich, but we're going to keep it as a once-in-a-while treat. Since so many people go to Burger King and have no problem with it, it's probably not an issue with their food - it's an issue with our stomachs. Oh well, you know we'll be back. Mom and I are just gluttons for punishment. I wish we could be gluttons for diet and exercise instead! 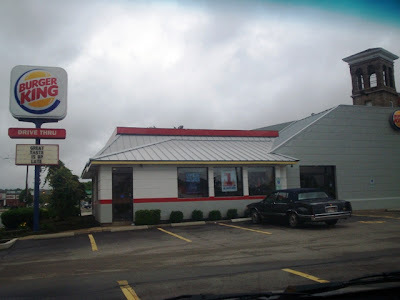 The Burger King visited in today's review is located at 66 Plymouth Ave., Fall River. For more information, call (508) 673-6272 or visit the Web site at www.burgerking.com.